Our new and improved wipe has arrived!! 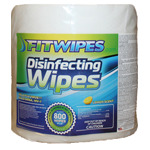 FitWipes® brand disinfecting wipes use the BEST 8"x6" fabric and lab certified disinfecting chemical. When ordering wipes to clean your fitness center or similar environment, please be sure to verify you are ordering DISINFECTING wipes. Many unfortunate and legal situations have been encountered by facilities who ordered wipes that simply spread harmful germs rather than killing them. FitWipes® Disinfecting Wipes are EPA registered and are lab proven to quickly destroy or deactivate some of the most virulent bacteria, staph, fungi and viruses, including E.Coli, Staphylococcus Aureus, Salmonella, Tuberculosis, HIV, Polio, Herpes and Influenza. EPA registered for use on Surfaces/Equipment: These wipes are generous in size to clean surface areas, yet tough enough to kill bacteria and staph, and are lint free and highly absorbent for better cleaning. The cleaning solution is safe to use on plastic, laminates, metals, plexiglass, and any other non-porous surface.